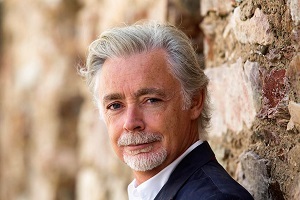 Jo Fletcher Books, Quercus' fantasy/SF imprint, is to publish Highfire, the first adult fantasy novel by Eoin Colfer, whose Artemis Fowl series has sold 25 million copies and been translated into 44 languages. Jo Fletcher, publisher at Jo Fletcher Books, bought UK and Commonwealth Rights in the novel from Sophie Hicks at the Sophie Hicks Agency. US and Canadian rights went to Jonathan Burnham and Emily Taylor at HarperCollins US, and translation rights have already been snapped up in France by Flammarion and in Germany by Heyne. Publication will be on 9 January 2020. Highfire is the tale of Vern, who has been hiding out in the Louisiana bayou until Squib Moreau explodes into his life, hotly pursued by a corrupt policeman, and his peaceful existence disappears in a hail of high-velocity projectiles. Fletcher said: "The name Eoin Colfer would have been enough, but I was doubly hooked the moment I met Vern, the vodka-drinking, Flashdance-loving dragon whose isolated life in the bayous of Louisiana is about to be interrupted by Squib Moreau, a swamp-wild, street-smart, dark-eyed, Cajun-blood tearaway looking to save his momma from the romantic attentions of a crooked constable. I can hardly wait to publish this remarkable, unforgettable book - think Pete's Dragon crossed with The Sopranos, with a touch of True Blood, perfect for grown-up Artemis Fowl readers the world over." Hicks said: "I am delighted that Eoin's brilliant new novel Highfire has gone to the impressive Jo Fletcher. Jo and her team's commitment and passion for the book from the very start has been incredible. Their enthusiasm for Eoin and for Highfire shows me that we are in great hands and I couldn't be more excited for what is to come." Colfer said: "I am thrilled that my dragon has found a roost at Jo Fletcher Books and Quercus. I cannot think of a better home for my first adult fantasy book and I hope that our relationship that got off to such a fiery start will burn brightly for years to come. I do apologise for the fire puns but I am excited!!" The first Artemis Fowl film, starring Judi Dench, Josh Gad and Miranda Raison, is released this summer.